The design and engineering of biological systems — a field known as Synthetic Biology —has been heralded by many to be the defining technology of the 21st century. Just as electronics and computers have changed almost every facet of our day-to-day lives, the consequences of engineering microbes might also be as far reaching. Engineered bugs are already being developed to produce pharmaceuticals and fuels, monitor their environment, detect trace chemicals, degrade plastic waste, and perform computing operations. Microbes, however, are considerably more complex — and hence less predictable — than electronic components. For this reason, one of the best strategies scientists have for engineering them is to use a brute force approach: try out as many different biodesigns as possible and see what works best. Doing this with microbes is tricky. Designing and constructing a single engineered bacteria is labour intensive and can take weeks. To circumvent this, researchers have turned to cell-free systems: a collection of biomolecules that can reproduce biochemical features of interest, for example the synthesis of proteins from a genetic circuit. This greatly simplifies things as after all you are now merely handling what is essentially a sack of chemicals. This is where it really gets interesting. As opposed to testing out different genetic circuits one-by-one in a test tube, Hori et al developed a microfluidic device which forms millions of droplets an hour – each droplet acts as a mini test tube, each containing a slightly different version of the circuit. The circuit was made up of three strands of DNA which interact with one another in a non-linear way to produce a Green Fluorescent Protein. The fact that it is non-linear means predicting how they interact is difficult and makes the tactic of trying out different combinations more appealing. Using microfluidics, the authors created a generic library by combining different ratios of these three components. 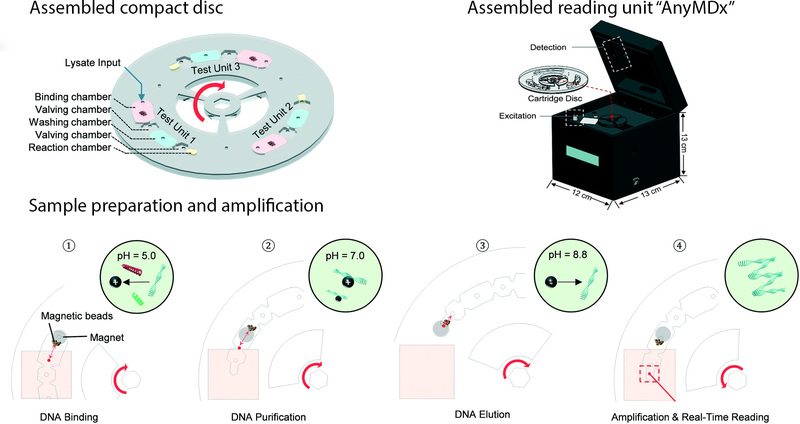 By incubating the droplets and monitoring protein production levels, they were able to map out the parameter space to see which genetic circuit from their library worked best. Although simply a proof-of-concept, this droplet microfluidic approach has shown to be incredibly powerful, and in addition to being used in genetic circuit design has the potential to rapidly explore large parameter spaces in other areas of chemistry and biology. *Free to access until 8th September 2017. 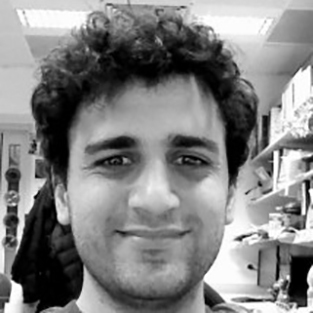 Yuval Elani is an EPSRC Research Fellow in the Department of Chemistry at Imperial College London. 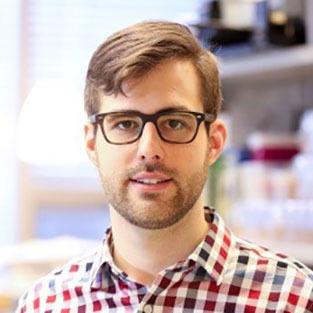 His research involves using microfluidics in bottom-up synthetic biology for biomembrane construction, artificial cell assembly, and for exploring bionterfaces between living and synthetic microsystems. There is no doubt that 3D printing is a hot technology with applications across all sectors of industry and life. The technology is attractive not only for its use in rapid prototyping, but also for its ability to form complex structures that could not easily be formed by other manufacturing techniques. There is also the added benefit of digital design—it is very easy to go from a CAD model to physical production without the need of additional tooling or equipment. For these reasons and others, 3D printing is an attractive manufacturing process for microfluidics. Albert Folch has argued that 3D printing is the solution to the barriers preventing the translation of PDMS microfluidics to commercial applications. 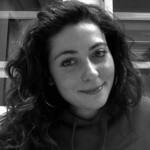 (Angew. Chem. Int. Ed. 2016, 55, 3862–3881.) However, printing resolution has limited the size of channels to the milli- and sub-millifluidic regimes. The challenge when it comes to microchannels is that commercial 3D printers are designed to form polymer features but microchannels, by their nature, are voids within bulk material. While many 3D printer manufacturers tout resolutions in the tens of micrometers, the reality is that the resolution of the void spaces can be several-fold larger. In their recent report, researchers at Brigham Young University have advanced 3D printing technology to print channels truly in the micro- regime. Left: Schematic illustration of 3D stacked serpentine channel design. Right: SEM image of 3D serpentine channel cross section. Achieving true micro-scale printing resolution required innovation in both the 3D printer and the resin material. Gong et al. modified a digital light processing (DLP)-type 3D printer to include a high resolution light engine and a 385 nm UV LED light source. DLP printers project a pattern of light over the entire plane, crosslinking an entire layer in a single step. The light engine enables resolutions in the x-y plane of 7.6 µm and their choice of a 385 nm light source opened a wide range of possible UV-absorbers to them. Twenty different UV-absorbers were evaluated and 2-nitrophenyl phenyl sulfide (NPS) was chosen as having all the desired properties, with the main criterion of enabling smaller void sizes in the z-dimension. The final composition of the resin was a mixture of poly(ethylene glycol) diacrylate (PEGDA), NPS, and Irgacure 819. This mixture created structures that have low non-specific adsorption and had good resolution in the z-axis. 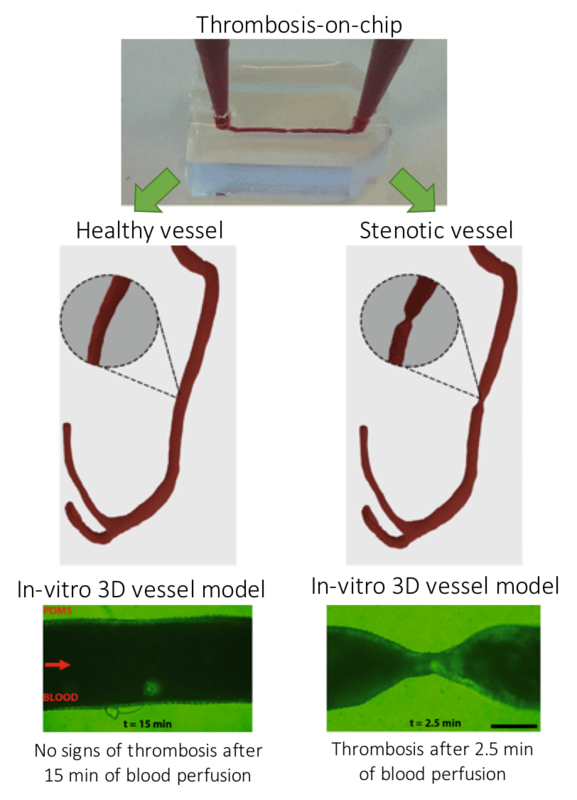 Additionally, the structures could be photocured with a broad-spectrum UV lamp after printing. Despite high-resolution printers and materials, a new printing regime also had to be developed to achieve the desired channel width. Because of scattering, the area of crosslinked resin tended to be smaller than the actual pixel size. This meant that channels, which are essentially voids of non-exposed space, came out wider than designed. The solution that Gong et al. devised was to perform two print patterns for each exposed layer. The first print pattern exposes the entire area, save for the channel void and the second exposure only projects a pattern along the channel walls. This method enabled reproducible printing of channels with a ~20 µm width. 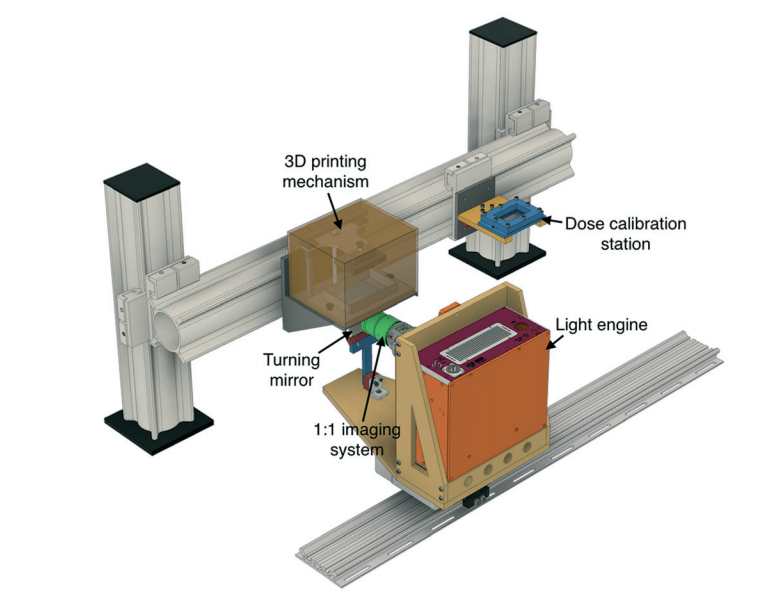 3D CAD model of the custom 3D printer by Gong et al. So how soon can you expect to get your hands on a 3D printer capable of printing true microchannels? While this report has been very promising, it is currently the only printer and only resin formulation with these capabilities. According to Greg Nordin, the corresponding author, the main challenge is to figure out “how to get this into people’s hands in a convenient way so they don’t have to mess around much to get it to work.” Like any new technology, for it to be truly useful, users want to spend more time making and less time fiddling. Fortunately, there already are markets for printing small, intricate parts, such as jewelry and dentistry, so it’s only a matter of time before manufacturers catch on to the market for 3D printed microfluidics. *Free to access until 29th August 2017. How can biosensors provide real-time health monitoring? Like a ripple spreading outwards on a pond’s surface, a plasmon is a collective oscillation of free electrons in a piece of metal. When the metal interacts with light (in this case k vector of light satisfies the momentum condition), the collective movement of oscillating electrons at the metal’s surface leads to the propagation of the light along the surface, also known as a surface plasmon. This simple physics rule is very helpful for sensor nanotechnology and optical signal processing applications since the offered advantages are significant, providing a smaller foot-print, lower limits of detection, and multiplexing opportunities. However, using sensors for biomolecule detection requires clever use of light. For example, surface plasmon resonance can be observed in nanohole arrays patterned on very thin gold films. Nanohole arrays can transmit light much more strongly than expected for the nanohole apertures at certain wavelengths. 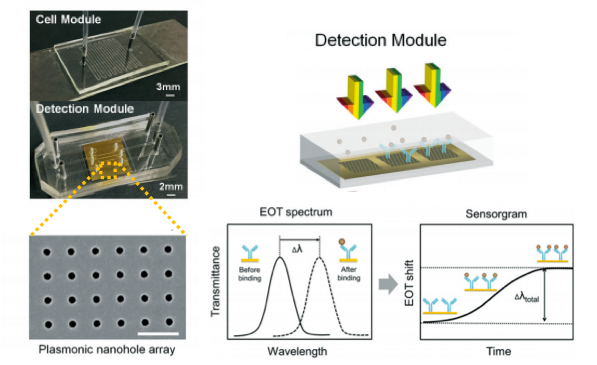 This phenomenon is called extraordinary optical transmission (EOT) and opens a new avenue for detection of minute amounts of biomolecules. 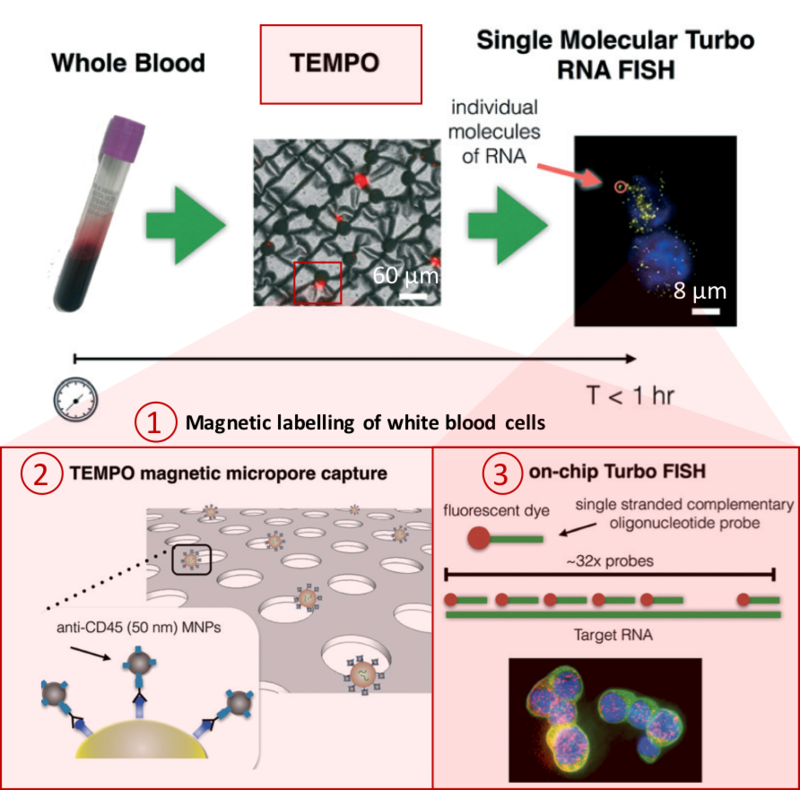 A nanoplasmonic biosensor was recently developed for real-time monitoring of proteins from live cells in a label-free configuration, thanks to extraordinary optical transmission. The biosensor is structured in a microfluidic device consisting of a cell module and the biosensor module. Microfluidic cell module design is based on a single zigzag channel for directly delivering the secreted proteins to the adjacent biosensor module via a tubing connection. The biosensor module consists of nanoholes fabricated on freestanding SiNx membranes. Antibodies specific to vascular endothelial growth factor (VEGF) are selectively immobilized on the gold nanohole arrays as biorecognition molecules. When the VEGF are captured on the sensor, a change of refractive index proximate to the surface is induced. This change results in a peak shift of the EOT spectrum (Figure 1). By tracing the spectral shifts continuously, the dynamics of cell secretion can be monitored. In this way, the secretion dynamics from live cancer cells are monitored and quantified for 10 hours. 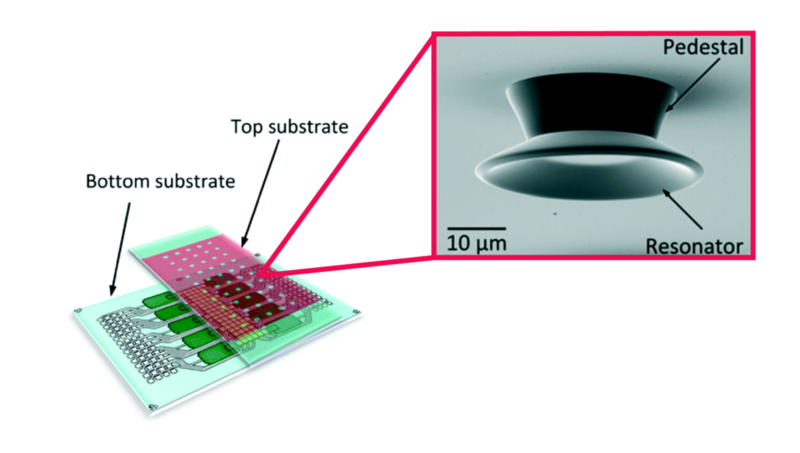 The proposed microfluidic device has unique capabilities for multiplexed and label-free detection in a compact footprint, which are promising for miniaturization and integration into lab-on-a-chip devices. 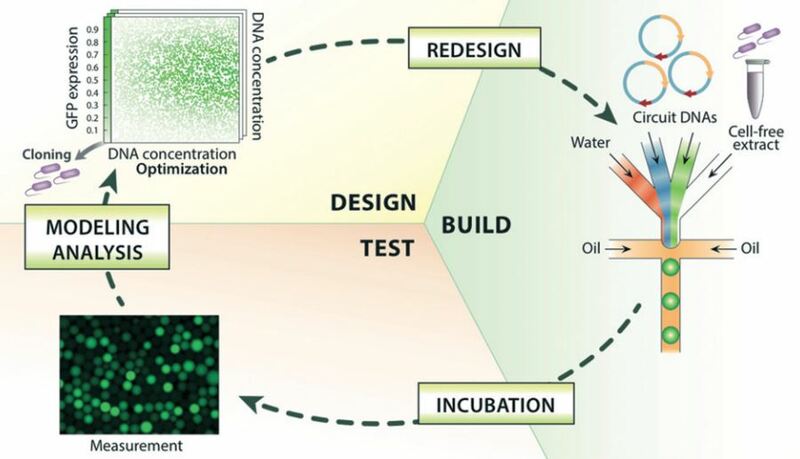 Design and working principle of microfluidic-integrated biosensor. Cancer cells grow in a zigzag channel, and secreted vascular endothelial growth factor are directly delivered to the adjacent detection module. Nanohole structures fabricated in the detection (biosensor) module are shown in SEM image with a scale bar of 1 μm (bottom left). The images on the right show the characteristic resonance peak (solid line) and EOT spectral shift of the peak upon binding (dashed line). Spectral displacements of the resonance peak based on molecular binding accumulation is shown in the sensorgram to reveal the real-time binding dynamics. Adapted from Li et al. (Lab Chip, 2017). This technology will have a potentially significant impact on medicine. Most of the patients agree that preventive medicine is preferable to reactive medicine. However, preventive medicine requires frequent physical exams, which can only be maintained by spending substantial time and money at physicians’ offices. The need for frequent check-up exams could be reduced or eliminated by real-time monitoring of the health status by portable biosensors in the future. Developing biosensors that allow real-time monitoring of target biomolecules is a big step towards the addressing this future goal. *Free to access until 7th August 2017. Computer games are a ubiquitous pastime and a great example of how a single programming language give rise to a myriad of games. But what about biotic games? How could you program biological systems to function in an interactive way? Biotic games are interactive applications that interface biology and computer science for the promotion of science. The Riedel-Kruse Lab at Standford specialize in developing biotic games that use light to control swarms of Euglena gracilis—a phototaxic microorganism that avoids—and can direct, capture, and move whole swarms or individual organisms. But programming swarms of microorganisms is no easy task. Swarms exhibit collective behaviour and therefore need to be controlled through local context rather than at the individual level. In their recent publication, the Riedel-Kruse Lab developed a set of hierarchical programming abstractions that allows swarms of Euglena within a biological processing unit (BPU; i.e., chip, microscope, and light stimuli) to be programmed in a single and efficient language at the stimulus, swarm, and system levels. At the lowest level, stimulus space programming (which the authors analogize to machine code) allows the programmer to have direct control over the various stimuli (e.g., turn left light on for 3 s), independent of the Euglena. Higher level programming at the swarm and system levels are more general and commands are given in terms of what the user wants the Euglena or system to do. For instance, swarm space commands direct the swarm in different operations such as move, split, and combine. System space commands incorporate conditional statements that can be used to confine a specific number of Euglena to a certain region or to clear Euglena from the field of view, for example. While Lam et al. used this new language to program a biotic game, this new language and approach to swarm programming could be generalized for any type of swarm and stimuli. One application could be to program swarms to construct complex structures on the microscale. In future, by increasing access to BPUs through cloud computing and releasing this new programming language it will be possible for hobbyists and researchers alike to write new programs and applications. And maybe this is just the beginning of a revolution like the one ushered in by the release of the personal microcomputer. *Free to access until 24th May 2017.